The Spanish and French National anthems are in danger of replacing the German and Italian versions typically used for the FIA's pre-race PA checks after Fernando Alonso continued to stamp his and Renault's authority on the title race by cruising to a second victory in succession and shrugging off the arrival of Ferrari's new car with a firm foot-down retort. Alonso hardly broke a sweat in the intense desert temperatures but he continued to set his Championship campaign on fire. He took it easy on Friday, then ramped up to the target on Saturday before securing an already certain pole position on Sunday morning and setting himself up for an afternoon cruise, his satisfaction completed when he lapped the best the World Champions had to offer. Ferrari had showed their hand with the subdued arrival of the F2005 by no longer lapping at speeds that put them outside the top ten runners. But, while there is no question it displayed the pace to put the World Champions back on the title trail, it certainly has some rough edges and it lacked the legs to make early front-running positions turn into points. The World Champions have a tyre problem, but whether it is down to partners Bridgestone failing to come up to scratch with the new regulations, the new scarlet charger being a bit of a tyre-eater, or mechanical problems preventing the team from displaying how it really works its tyres is sure to remain firmly inside the walls of Maranello. In truth it is probably a bit of all three. Schumacher displayed enough pace to top a practice session and secure a front row spot on the grid even though the car looked to be a bit of a handful. But he was stopped from displaying just how a well set-up F2005 would handle the final portion of a race, the vital part in these days of long-life tyres, when the failure of a carry-over F2004 part put him out of the race too early to tell. Barrichello's ability to shoot through the field from 20th to 10th in three laps displayed the kind of Ferrari performance of old, but his lack of practice, because of a gearbox problem, forced him to use a set-up based on his teammate's desires rather than his own and that will certainly have helped in his late plunge down the order and out of the points. Ferrari, as ever, took positives from the new car's arrival, but it clearly was not the answer to their problems just yet and it did nothing put the fear up Alonso and his Renault team. Sandbagging is something that Ferrari were long accused of, but this time Renault have already openly admitted to be holding back some pace for when the going gets a little tougher. Toyota continued to stay at the front as Trulli increased his claim to the number one spot with another second place after out-classing their original key man Ralf Schumacher, who finished fourth. The Germany-based squad are still not quite close enough to make Renault step up a gear but they are now determined to put all their money, might and manpower into the chase. 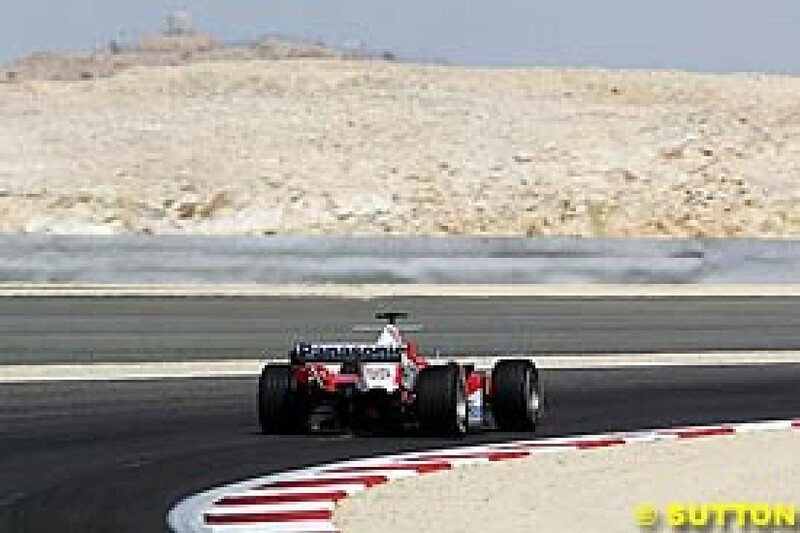 This year's Bahrain weekend was as much diametrically opposed to that of 2004 for McLaren as it was for Ferrari. Last year, as the World Champions secured a comfortable victory, Raikkonen put the boot into the Woking outfit by ensuring his engine failure was spectacularly enflamed. This year he was on the podium after finally turning the team's promise into points. Even more key than Raikkonen's podium third place, however, was the fastest laps chart, which displayed Pedro de la Rosa, a race replacement for the injured Juan Pablo Montoya, on top of the pile and Raikkonen in third behind Alonso. The speed trap showed a similar picture, with de la Rosa fastest and Raikkonen second, and it all showed that McLaren do have the potential to perform. De la Rosa, back on the grid for the first time since 2002, was one of the stars of the day, his daring display of car-to-car dicing, despite his lack of race experience, putting his McLaren into fifth. But Williams were a disappointment after failing to turn their second-row start into anything more than a sixth place finish for Mark Webber and a spluttering engine for Nick Heidfeld. Red Bull Racing saw their dream start finally fade as Christian Klien failed to take the start but David Coulthard managed to complete an unexpected hat-trick of points finishes thanks to the rather untypical retirements from front-running teams. Renault, Williams and Ferrari all saw one car fail to make it to the finish as the gruelling conditions took their toll. But there was no team more distraught than BAR, who saw two previously un-encountered problems keep them from the chequered flag. 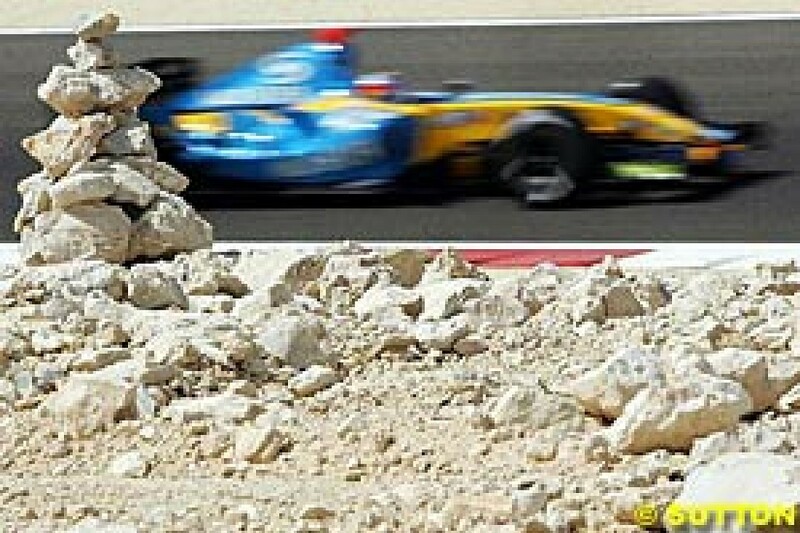 That is six retirements from six potential finishes for a team that confidently stated a race victory as their target for 2005 and that top step of the podium now looks higher than a mountain summit as they sit fixing problems at base camp. Alonso, on the other hand, is packed up and on his way and left the Middle East with the knowledge that, while Ferrari are clearly on the way back, his once out-of-touch rival Michael Schumacher has just two points and is more than two clear victories behind. This time two years ago 16 races would be a full season, so with that many now remaining Alonso has a 24-point head start. After three races, the new aggregate qualifying format, love it or loathe it, has finally become an understandable part of the weekend and it has become clear that the starting position for the first session is now more vital than ever before if a driver is to achieve a good grid position. Starting early in the session, particularly on a track like Bahrain, where the swirling wind dragged up dust despite the organisers' best efforts to prevent it from doing so, meant drivers who struggled in the previous race were already in trouble for this one before they even secured a place on the grid. That said, those who did well continued to do well and once again the performance of Alonso, in his Renault, and his former teammate Trulli, in his Toyota, were both in the running once again. But then came the new Ferrari to prove single lap pace is nothing without race-long speed. As the winner of the last race in Malaysia, Alonso was the final runner in the first session and benefited from a track with more grip to set the fastest time. He admitted he had to push hard to maintain his provisional pole position in the second session after strong winds hit the circuit on Sunday morning but he achieved his aim with more than four tenths of a second to spare. After a cautious Friday practice Schumacher showed the new car's potential by topping the times in Saturday morning's first 45-minute run then planted it in third in first qualifying, setting the second fastest time of the first sector despite a lock-up but struggling in the second two to drop behind Trulli. But he achieved his aim of a front row start by jumping the Toyota driver at the second attempt. Trulli put himself up to a provisional front row start spot with a stunning performance in the second part of his first qualifying lap, when he was fastest overall in the final sector. But after suffering with an ill-handling car he let more than half a second slip to Schumacher on his second run and had to settle for third spot. Heidfeld put Williams in an unexpected position and out-qualified his teammate Webber in the process thanks to his second fastest time in the final sector of the first session. He did enough to hold station in the second run to equal his best ever qualifying position, which had previously been set in Austria 2003, and secure a third consecutive second-row spot for Williams. Webber was around two tenths slower than teammate Heidfeld in both the first and second sessions but after finishing the first run in fifth he moved up a place when Giancarlo Fisichella dropped right down the order in the second qualifying run. Once again the younger Schumacher proved to be second best to teammate Trulli over the aggregated single lap runs - but that is not surprising considering Trulli is considered the master of the discipline. He finished almost a second off Trulli in the first run after oversteering at turn eight but impressively bettered the Italian in the second to improve by a massive five places. 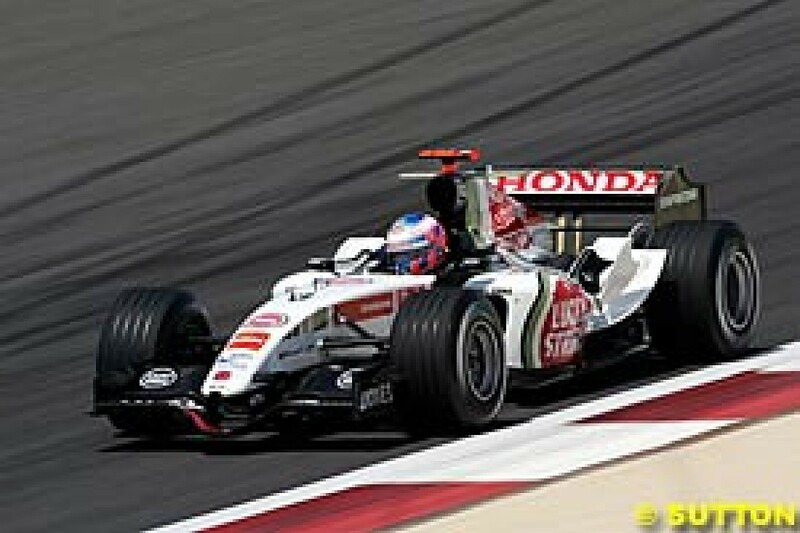 In what would prove to be his last race before being replaced by test driver Vitantonio Liuzzi, Klien put in a much better showing than teammate Coulthard. He finished within a second of the fastest lap on Saturday and kept Red Bull in the hunt for points with a solid performance in the second run to make up one place through Fisichella's downfall. His number one start position, a slippery track and a lack of experience of single-lap qualifying left de la Rosa with plenty of excuses for his first run but he put in a solid lap to sit just inside the top ten after first qualifying. He then excelled himself by setting the fourth fastest lap in second qualifying to leap-frog teammate Raikkonen on the grid. Raikkonen cost himself vital time in the first session when he ran wide in the final corner of the lap having set the third fastest time in the first two sectors. He had to settle for the seventh fastest time then dropped two places down to ninth on a disappointing second run. Starting seventh in the first session proved only a minor obstacle for Fisichella as he finished just more than half a second behind his teammate Alonso. But a disastrous lap in the second run, which saw him set a time more than 1.2 seconds down on Alonso, cost him a vital five places on the grid as he became one of the biggest first-to-second session losers since aggregate qualifying began. It was always going to be difficult for Button, starting fourth in the session after his disastrous engine failure three laps into the last race in Malaysia, and he could only manage 12th place, more than a second off the pace. Although he finished even slower in the second session relative to the fastest lap he still managed to jump past Massa and gain a place. Massa praised the team for a dramatic improvement to his car after practice that allowed him to set a time that he was delighted with as he finished at the bottom of the top ten runners. But he slumped in second qualifying when he set the 12th fastest time and dropped two places to 12th. Out second in the first session, Sato struggled with the slippery track and complained of the dust, the wind and the heat as he finished down in 13th spot, one place behind teammate Button. He fared no better in the second run, equalling his 13th spot and finishing a total of 3.661 seconds off the lead pace. The rejuvenated Coulthard finally saw his bubble burst as he struggled to find the balance of his Red Bull Racing car. He set a slow first qualifying lap after getting confused at the start of his run when he could not hear his radio bleeps and continually hit the rev limiter, losing more than a tenth before even arriving at the first corner. He failed to recover and finished 14th in both sessions to put him in the same position on aggregate. 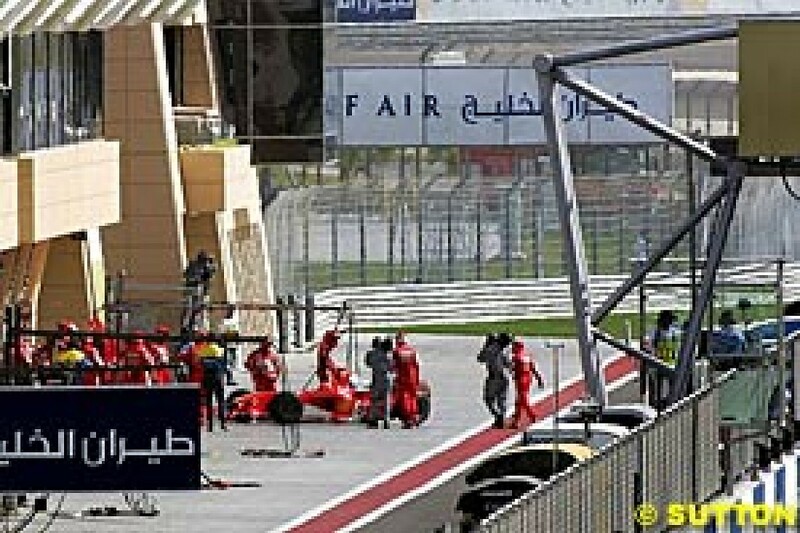 Disaster struck Barrichello's new Ferrari as soon as it hit the track and he completed just one flying lap in the four practice sessions as gearbox problems kept him in the garage. A temporary repair allowed him to set a time in first qualifying, albeit 15th. The replacement, flown in from Italy, was fitted for his second run but he was forced to slow when it failed and the engine overheated and he stopped at the end of the pitlane after setting the 16th fastest lap. The gearbox was changed back and he dropped to the back of the grid when the team chose to change his engine as a precaution. Despite ignoring the pressure of media speculation over his future Villeneuve continued to suffer his woes in first qualifying as he struggled with an understeering car, ran wide at the final corner and set the fifth slowest lap of the day, 1.4 seconds slower than teammate Massa. He improved one place in the second session but was still 1.4 seconds off Massa's second effort and stayed 16th overall, more than six seconds off the lead pace. Beating his teammate Karthikeyan was all Monteiro could hope for as he trundled his well-off-the-pace Jordan around the desert circuit. He failed to better the Indian driver in the first run and criticised himself for failing to have the confidence to push hard. But he finished almost a second faster than Karthikeyan in the second session to jump the position. Karthikeyan has enjoyed the upper hand at Jordan so far this season so it was no surprise to see him finish ahead of his teammate Monteiro in the first session. But he slipped up in the second and dropped vital time to let the Portuguese driver overhaul him. After focussing on improving his car's single lap potential Albers was happy to have done so as he finished almost nine tenths of a second ahead of teammate Friesacher. He held station in the second run and slotted into 19th spot. The new car cannot come soon enough. Friesacher finished exactly five seconds slower than session leader Alonso in first qualifying after struggling with understeer and making a few mistakes. His team changed his engine before second qualifying, so his lap mattered little, but he managed to stay in single figures of deficit as he finished a total of 9.359 seconds off the lead pace. But, interestingly, that is still within the old 107 percent rule. The desert heat built during the hours of Sunday morning to ensure the race would be the hottest in history and as ambient air temperatures reached a body-burning 42 degrees, the dryness left the race-suited mechanics needing bottles of water after their walk to the grid and drivers filling up with liquid to hydrate themselves before the off. Red Bull Racing driver Klien need not have bothered because he was out before the race began when his car stalled on the grid and was pushed to the pits. The team tried to repair it to take the start but there was nothing they could do and their dream of a hat-trick of double points finishes to start the season had already slipped away. Red Bull technical director Guenther Steiner said: "It seems like we had an electronic problem due to the heat (on the grid) and the car did later fire upon a second try in the garage. We have to go home, do an investigation and sort out the problem for the next race." But it was too late for Klien as he will be replaced by Vitantonio Liuzzi at Imola. When the lights went out for the rest of the grid it all went as expected, with Alonso fast starting as ever and Trulli pulling alongside Schumacher after benefiting from the cleaner side of the grid. Trulli tried to pass around the outside but Schumacher was able to hold onto his place and the Italian settled back to play a watching role as Schumacher challenged Alonso ahead. Both Williams and McLaren swapped back into their 'anticipated' order as Webber found a way past Heidfeld and Raikkonen made it past de la Rosa during the opening lap. Fisichella also passed the McLaren substitute, but the fast start of the day was Barrichello, who proved his car is quick when it has new tyres as he shot from 20th to 13th by the end of the first lap. Albers pitted at the end of the first lap to solve a problem with his Minardi while Karthikeyan retired his Jordan on the third lap, which also saw Barrichello complete his rocket ship rise into the top ten as Fisichella's Renault utter the first signs of a terminal problem when it emitted a tell-tale puff of smoke. 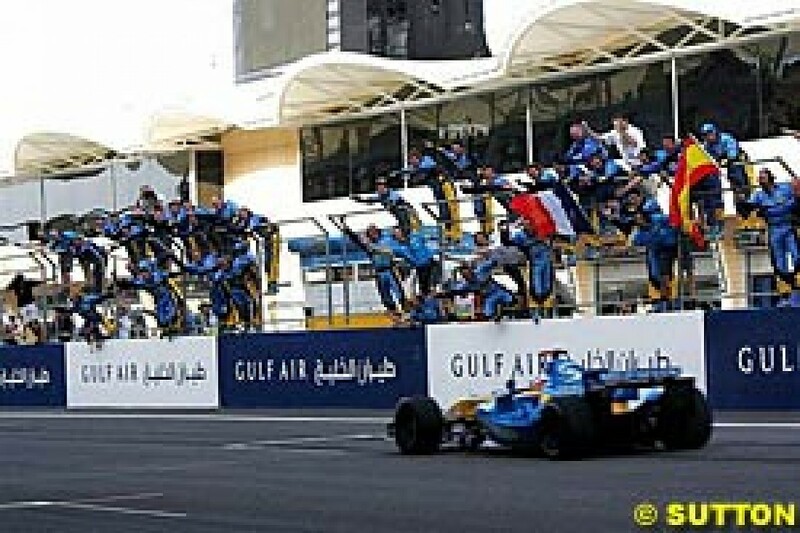 Fisichella was forced into the pits at the end of lap four but he optimistically returned to the track before pulling in again at the end of the next to post his second consecutive retirement. "Giancarlo's engine started to fail on lap two," said Renault engineering director Pat Symonds. "We knew there was nothing we could do." Schumacher was doing everything he could, however, as he hounded Alonso at the front, staying within one second of the Renault driver as the field mostly held station in the opening few laps. Heidfeld had his hands full keeping Ralf Schumacher at bay but did just that and Friesacher was the only real mover as he made it past the Jordan of Monteiro on lap ten. Alonso had comfortably absorbed the pressure from Schumacher but the same could not be said of the German's car. On lap 12 he locked his brakes, the rear end broke away and he went straight on at turn 10. He coasted to the pits and retired at the end of the lap, his tyres badly damaged but, more crucially, his car's hydraulic pump no longer functioning. "I retired because I had no hydraulic pressure, so I could not change down through the gears, which is why I went wide and had to use the run-off area," explained Schumacher amidst his positive appraisal of his new car after the race. Indeed, for the opening few laps, at least, Schumacher had shown the machine could keep pace with Alonso's Renault. But 12 laps are not enough. Team boss Jean Todt was quick to steer the blame away from the new F2005. "It was the hydraulic pump, but it was not due to the new car," he said. "It wasn't something that had been changed from the old car to the new car. We want to get to know the car better, then I think we shouldn't be in too bad a situation for the Championship." Schumacher's early departure gave Alonso some time and space to breathe at the front, with Trulli a comfortable three seconds behind and Webber well adrift in third as the race drew towards the first raft of pitstops. That began with Ralf Schumacher peeling off on lap 18, followed by Alonso two laps later and Trulli and Webber one lap after that. Trulli came out in fourth but Webber slotted in behind the gaggle of cars that had just been fighting for the lower points positions and while the leaders were making their stops de la Rosa was under pressure from Barrichello and Button and on lap 21 he made a mistake, ran wide, and lost two places as the two more race-ready drivers went by. Heidfeld and de la Rosa pitted at the end of lap 23 as Ralf Schumacher made a mistake in his Toyota and ran wide but held his position. Raikkonen stayed out one more lap and pitted at the same time as Button then Sato and Barrichello came in at the end of lap 25 and Barrichello came out ahead with Button and de la Rosa sandwiched between them. Heidfeld was forced to retire from eighth place after trailing a plume of smoking engine bits for half a lap and BMW boss Mario Theissen apologetically admitted that it had maybe been a mistake to change Heidfeld's engine before the Malaysian Grand Prix and force it to go through two such intensely hot races in succession. "Even with the car's maximum cooling configuration we were running at thermal-limits, and Nick drove the only car with an engine that had already endured the Malaysian heat," said Theissen. "The combined temperature effects of both those races was obviously too much." The heat was also too much for BAR's brake material as Sato's car slithered into the first corner on lap 27, its front left wheel emitting a plume of black dust from its centre. Another spin at turn ten proved to Sato that it was not a problem he could drive around and he was forced to pull into the pits and retire for the third time this season. "We had runaway brake wear with Takuma's car with not a lot of warning," said BAR technical director Geoff Willis. "We were obviously disappointed by the problem, but there is a straightforward solution to that - material properties - so we will not be using that material again for racing. This sort of reliability is not typical of us and we will get to the bottom of it." David Coulthard had clearly tried to make the best out of his terrible grid spot in the Red Bull car by fuelling up heavy for the first stint and he was the final runner to make a stop when he pitted at the end of lap 26. By lap 28, with all the first stops completed, Alonso had a lead of 7.1 seconds over Trulli with Webber 28.2 seconds behind in third. Trulli then began to push and started closing on the Renault but Alonso was quick to respond and as soon as he did so the Italian driver knew the race was already a done deal for his Spanish rival. "I was catching up but I think he was just waiting," said Trulli. "When he started to push he pulled away and the only thing I could do was focus on finishing second." De la Rosa passed Button for seventh on lap 33 then Webber spun sideways at turn ten on the following lap to hand his podium position to Raikkonen, with the locked-tyre spin set to have consequences later in the race. Raikkonen also ran wide when he locked up and trundled across the run-off area at turn 13 two laps later but he was alone in third and maintained his position. The first sign of Barrichello's imminent tyre problems were displayed on lap 37 when de la Rosa closed right on the back of his Ferrari. The Spaniard tried to pass at turn one on lap 38 but ran wide and eventually made it past on lap 41, the same lap that Alonso calmly pulled into the pits for his second smooth stop of the day and Ralf Schumacher pitted from fourth. Trulli took over the lead but pitted on the very next lap, as did Webber, and Alonso moved back into the lead before Raikkonen stopped on lap 43 and De la Rosa came in one lap later from third place. Button had passed Barrichello on lap 44 but his smile would only last for two laps before both pitted for their second set of stops and BAR stumbled upon another disaster. "When I tried to select first and pull away I couldn't pull away," said Button, restraining his anger more effectively than he had when engine failure put him out of the Malaysian Grand Prix. "The guys did a fantastic job to try to get me back into the race but then the car stopped at the pit lane exit. It's not as frustrating as Malaysia because I don't think we were as quick here." That left Alonso alone out in front to cruise to the finish with bags to spare while Trulli and Raikkonen sat in a comfortable second and third respectively and Ralf Schumacher continued his quiet but satisfactory race to hold onto fourth with no chance of chasing down the McLaren ahead and stealing the final podium place. Barrichello's slide continued and although his tyres were not as bad as they were in Malaysia, where they were so damaged he retired, he was losing up to three seconds per lap on his rivals and Massa managed to pass him for seventh on lap 51 then, in an embarrassing moment for the World Champions, Alonso put the new F2005 machine one lap down on lap 52. Barrichello then dropped further towards Villeneuve but the Canadian missed out on the chance of passing the Ferrari when he was hit by Coulthard three laps from the finish and spun off the track. He returned to the pits but said: "I could feel something wrong at the back of the car and we discovered there was damage to the rear suspension where David had hit me." Coulthard apologised later, but he had a Ferrari to chase before he could get to that and he continued to reel in Barrichello as the Brazilian struggled with his tyres. "They were good in the first part of the race but I had to use Michael's set-up and I began to get too much oversteer as the tyre degraded badly so my lap times got slower," said Barrichello. Before Coulthard could finish off Barrichello, the focus was on de la Rosa as he hounded Webber's ailing Williams for fifth. Webber was struggling for grip and admitted: "My tyres were in bad shape after I spun and the car was difficult to drive because of strong vibrations." He succumbed to the McLaren driver on lap 55 after a bold defence. Coulthard passed Barrichello for eighth on the final lap before Alonso cruised across the line to celebrate as Ferrari faced up to the unthinkable of finishing a race without a point. And when the circus flew home in the early hours of Sunday morning Renault and Ferrari were left wondering just when they would wake up from their respective sweet dreams and nightmares. Pre-race: Seventh-fastest qualifier Christian Klien fails to start the parade lap and is wheeled into the pits, where he retires. Lap 1: After qualifying on pole position for the second consecutive race, World Championship leader Fernando Alonso beats Michael Schumacher (starting from the front row for the first time since Japan last October) off the line and pulls out a 0.3s lead. Jarno Trulli pitches for second but is abruptly repelled. 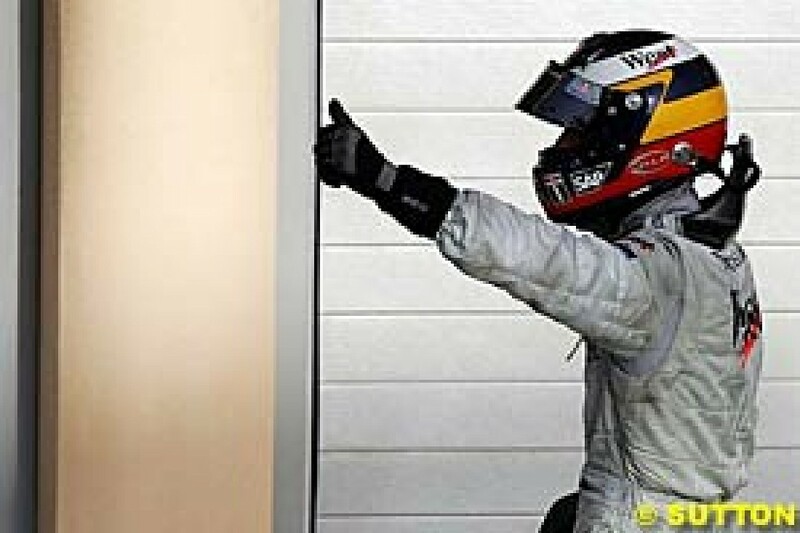 Mark Webber vaults teammate Nick Heidfeld as the Williams-BMWs settle into fourth and fifth. Ralf Schumacher grabs sixth from Kimi Raikkonen and Giancarlo Fisichella (who locks his fronts in pursuit of the Finn). Pedro de la Rosa loses out to Jenson Button but repasses before the end of the lap. Takuma Sato, Felipe Massa, Rubens Barrichello (who qualified 15th but started last after a pre-race engine change), Jacques Villeneuve, Narain Karthikeyan, David Coulthard, Tiago Monteiro, Patrick Friesacher and Christijan Albers complete the order. Albers makes an unscheduled stop. Lap 2: Michael Schumacher has a vain lunge at Alonso into Turn One. Sato passes de la Rosa and Button to take ninth. 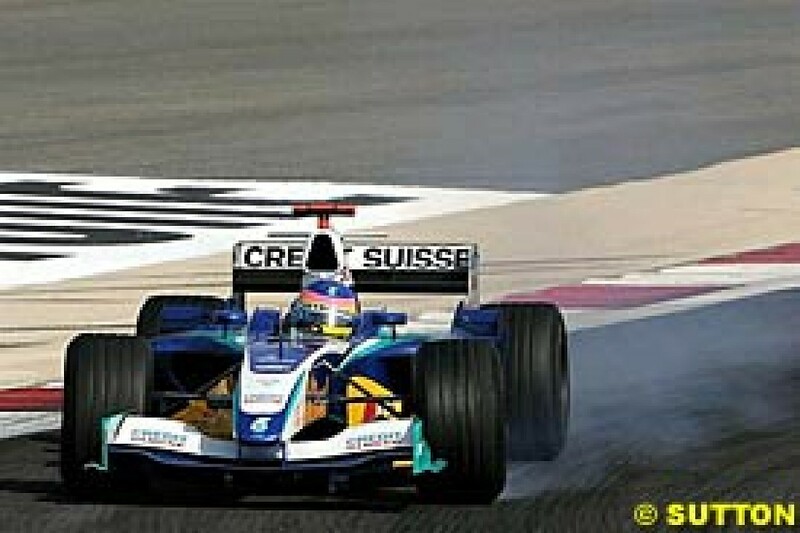 Barrichello moves up to 11th, at the expense of Massa and Button. 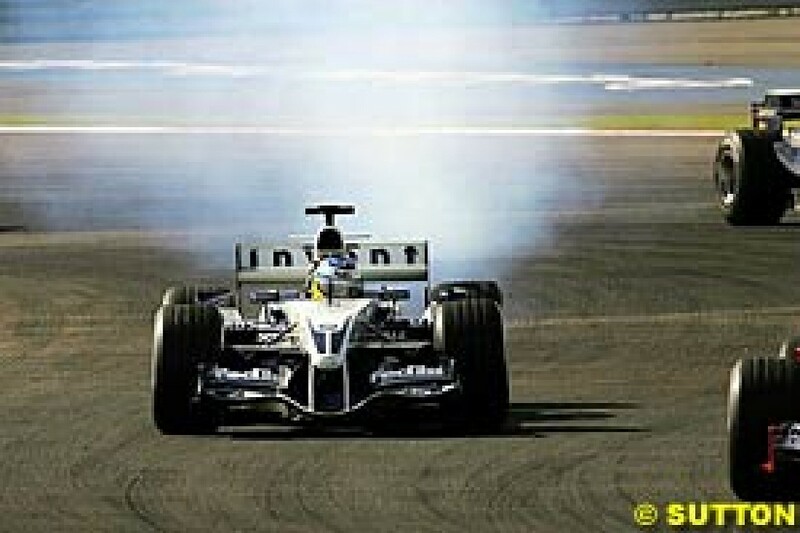 Fisichella's engine begins to smoke. Lap 3: Alonso extends his lead to 0.9s after lapping in 1m 33.559s, his best yet. Fisichella pits - but drives straight through and rejoins. Karthikeyan pulls off with a technical problem to retire. Lap 4: Fisichella pits again - and this time he stays there. Lap 5: Alonso leads by 1,0s, but Michael S is holding on. Trulli and the others are now a couple of seconds further adrift. Lap 6: Michael S goes fastest - 1m 32.932s - but his deficit remains 0.8s. Lap 7: Sato's car begins to emit a trace of engine smoke - or possibly brake dust. Lap 8: Heidfeld runs slightly wide at Turn 10 and allows Ralf S to draw alongside, but he rebuffs the challenge and retains fifth place. Lap 9: Heidfeld errs again - and this time Ralf S makes his move stick. Lap 12: Michael S locks up and runs wide at the Turn 9/10 complex. He rejoins but continues slowly to the pits. Ferrari cites a hydraulic problem - Schumi's first mechanically-enforced retirement since Germany 2001. Alonso leads Trulli by 3.0s. Lap 14: Stuck behind Sato since lap two, de la Rosa tries to pass but fails. Alonso ups his pace to 1m 32.417s. Lap 16: Sato is holding up a chain of cars - de la Rosa, Barrichello and Button - in seventh to 10th places. Lap 18: Alonso dips below the 1m 32s - 1m 31.994s. Ralf S makes the race's first scheduled stop. Lap 19: Alonso laps in 1m 31.872s and is now 18.4s clear of third-placed Webber. Lap 20: Alonso pits and Trulli takes the helm - for now. Lap 21: Trulli and Webber pit. De la Rosa finally passes Sato at Turn One - but runs wide and drops to ninth, behind Barrichello and Button. Lap 22: Alonso resumes the lead. Massa pits. Lap 23: Heidfeld, de la Rosa and Albers pit. Lap 24: Ralf S loses time with a brief off-track excursion. Raikkonen and Button pit. Lap 25: Sato and Barrichello refuel. Lap 26: Heidfeld pulls off in a haze of engine smoke. Coulthard pits. Lap 27: With all leaders having stopped, Alonso heads Trulli, Webber, Raikkonen, Ralf S, Barrichello, Button, de la Rosa, Massa, Villeneuve, Coulthard and the lapped Monteiro, Friesacher and Albers. Sato goes off twice during the lap and retires at the end of it. Lap 33: De la Rosa slices by Button to take seventh. Lap 34: Webber spins at Turn 10 and drops to fifth, behind Raikkonen and Ralf S.
Lap 35: De la Rosa is putting Barrichello under fierce pressure. Lap 36: Raikkonen loses time - but no positions - when he runs off Turn 13. Lap 37: The distant Alonso laps in 1m 31.840s. Lap 38: De la Rosa passes Barrichello at Turn One - but promptly runs wide again and has to do it all over again. Lap 39: Alonso laps in 1m 31.713s. Lap 41: Alonso and Ralf S pit. De la Rosa passes Barrichello - successfully this time. Lap 42: Trulli and Webber pit. Alonso resumes his lead. Lap 43: Raikkonen and Massa refuel. De la Rosa posts the race's fastest lap - 1m 31.447s. Lap 44: De la Rosa pits. Button passes Barrichello. Lap 46: Button and Barrichello peel into the pits simultaneously. Button stalls. Although he eventually gets going again, the Englishman pulls off before the end of the pit lane. Lap 47: Alonso has a huge lead as the final stint settles down. Trulli, Raikkonen, Ralf S, Webber, the closing de la Rosa, Barrichello, Massa, Villeneuve, Coulthard, Monteiro, Friesacher and Albers complete the list of survivors. Lap 52: Massa passes Barrichello at Turn One to annexe seventh. Lap 54: Villeneuve goes off at Turn One but rejoins, now behind Coulthard. Laps 48-54: De la Rosa and Webber stage an epic duel for fifth. Lap 55: De la Rosa's persistence pays off at Turn Four. He immediately drops Webber by more than two seconds. Villeneuve pits and retires. Lap 57: Alonso wins by 13.4s to extend his World Championship lead. 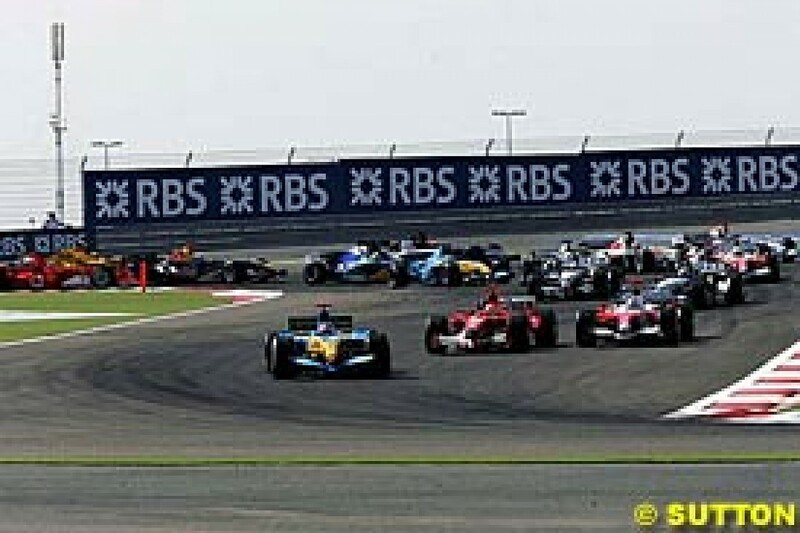 Trulli, Raikkonen, Ralf S, de la Rosa, Webber, Massa and Coulthard, who passed the struggling Barrichello in the closing stages, complete the top eight.